A few days ago I finally unfolded my Baby Mac workshop loom, got out my notes from Kay Faulkner’s 3-day workshop on Warp-Faced Weaves at the ANWG Conference in June, and went back to figuring out what to do with my 4-yard warp. I last blogged about it in this post after the conference. I hadn’t made it much farther than getting the warp on the loom. 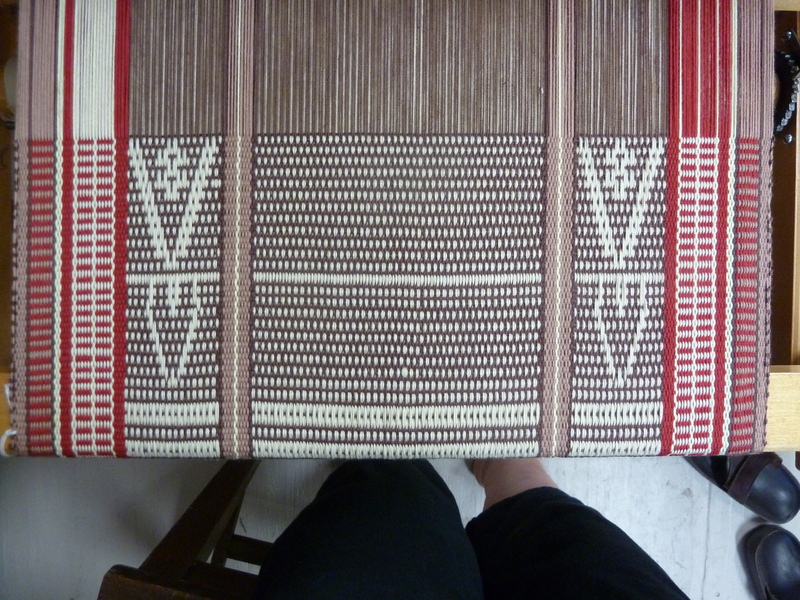 My warp is threaded for a combination of plain weave sections alternated with the Sotis cloth (patterns from West Timor). Kay’s notes are based on a nomenclature she came up with that makes sense to her, but isn’t terribly clear until you figure it out. 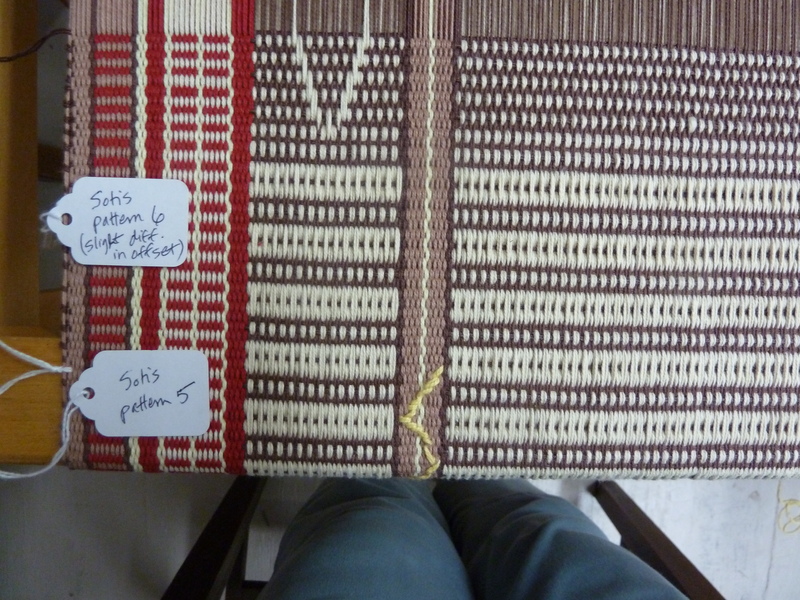 I also had her article from Handwoven Mar/Apr 2013, and studying the weaving pattern from that was a great help. I wound up making my own notes about how to weave the 6 basic patterns she gave us. In the above photo, you can see where I was trying the “warp wrapping” with a banana yellow color, in one of the plain weave areas. Not with a great deal of success. However, I am not sure I want to use this technique in my project so may or may not follow up with more experimentation. I was more interested in getting a pattern motif in the Sotis areas, which has to be done with manual pickup of threads for this simple threading. After a first attempt, I was starting to understand how this works, and made a plan for a motif. and what do you know – it worked! Basically, this is done within the context of Basic Pattern 4. 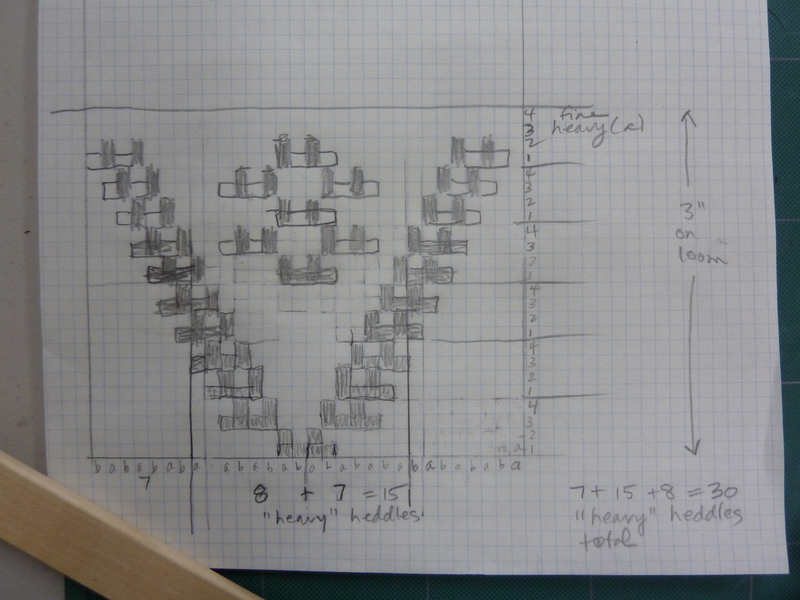 In my sampler, of the 60 heddles threaded for each side section, 30 are threaded with a single dark brown thread (can be thought of as “tabby a” for the section) and the other 30 alternate heddles are threaded with 3 cream threads run together (can be thought of as “tabby b” for the section). The ones with 3 threads are referred to as “heavy”, to alternate with the dark brown “fine” threads. But, those 30 heavy threads can also be lifted in alternating groups of 15. This is how you get some of the patterns. The pickup motif is done on a ground of basic pattern 4, where one bar uses just heavy “a” and the next bar uses heavy “b”. 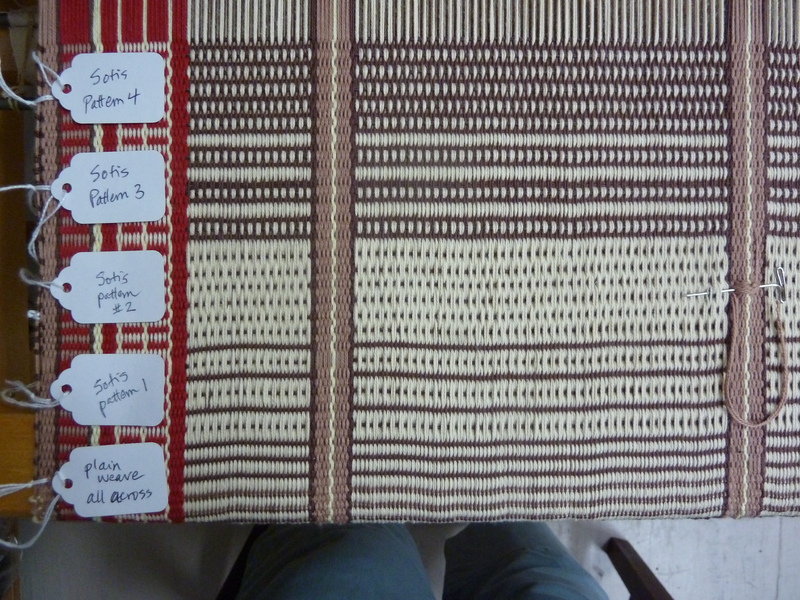 I may try out the “exposed weft” technique next, then move on to weaving some placemats using combinations of the basic patterns, and incorporating my little pickup motif. I also now know why Kay does some of her more elaborate Sotis pieces on a 24-harness computer loom, where she can treadle the Sotif motifs and not use pickup! It works, but is slow and for now at least, requires vigilant attention to detail.